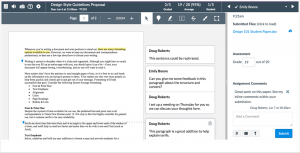 The Box previewer and Crocodoc annotation tools throughout Canvas have been replaced with Canvas DocViewer, which provides improved performance for a variety of document and image types. The Canvas DocViewer will continue to have updates and improvements on functionality over the next few months. View the full Canvas Guide on the new Canvas DocViewer. Caution: The ability for professors and students to download an annotated PDF is currently not available, but will be available soon. If you have students submitting drafts, please create separate assignments so that annotations remain available to students. This week Dartmouth turned on the Student Context Card feature just in time for summer courses. You can click a student's name anywhere in Canvas and view a summary of that student's progress in the course. 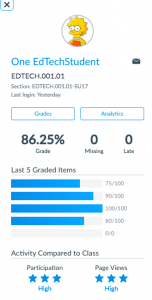 The context is generated from grades in the Gradebook and standard page view and participation activity from course analytics. 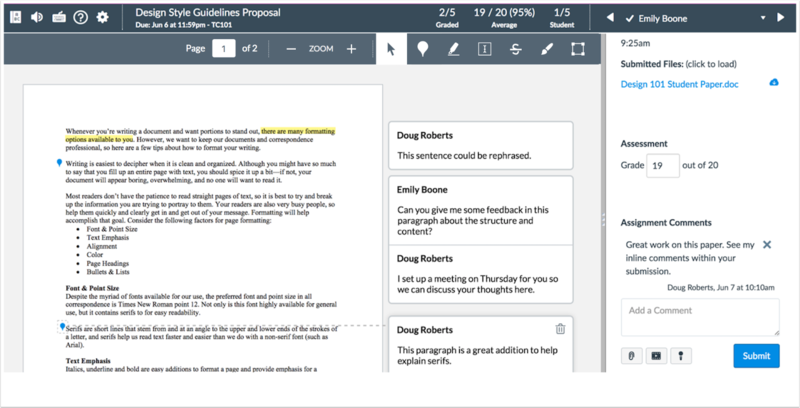 Messaging the student is also possible by clicking the mail icon. View the full Canvas Guide on Student Context Cards. Need help with the latest updates? Click Help in Canvas for 24x7 Live Chat and phone support or email edtech@dartmouth.edu to reach the instructional design team.